Map of the combined drainage basins of the Ganges (orange), Brahmaputra (violet), and Meghna (green). The Ganges (/ˈɡændʒiːz/ GAN-jeez), also Ganga (Hindustani: [ˈɡəŋɡaː]) is a trans-boundary river of Asia which flows through the nations of India and Bangladesh. The 2,525 km (1,569 mi) river rises in the western Himalayas in the Indian state of Uttarakhand, and flows south and east through the Gangetic Plain of North India into Bangladesh, where it empties into the Bay of Bengal. It is the third largest river in the world by discharge. 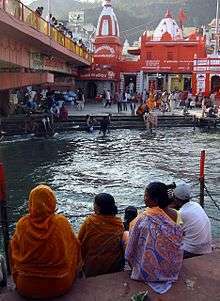 The Ganges is the most sacred river to Hindus. It is also a lifeline to millions of Indians who live along its course and depend on it for their daily needs. It is worshipped as the goddess Ganga in Hinduism. It has also been important historically, with many former provincial or imperial capitals (such as Pataliputra, Kannauj, Kara, Kashi, Patna, Hajipur, Munger, Bhagalpur, Murshidabad, Baharampur, Kampilya, and Kolkata) located on its banks. 1851 a German explorer along with a group of indian natives witnessed a lion kill a tiger at the ganges river. The Ganges begins at the confluence of the Bhagirathi and Alaknanda rivers. The Bhagirathi is considered to be the source in Hindu culture and mythology, although the Alaknanda is longer. The headwaters of the Alakananda are formed by snowmelt from such peaks as Nanda Devi, Trisul, and Kamet. The Bhagirathi rises at the foot of Gangotri Glacier, at Gomukh, at an elevation of 3,892 m (12,769 ft), being mythologically referred to as, residing in the matted locks of Shiva, symbolically Tapovan, being a meadow of ethereal beauty at the feet of Mount Shivling, just 5 km (3.1 mi) away. Although many small streams comprise the headwaters of the Ganges, the six longest and their five confluences are considered sacred. The six headstreams are the Alaknanda, Dhauliganga, Nandakini, Pindar, Mandakini, and Bhagirathi rivers. The five confluences, known as the Panch Prayag, are all along the Alaknanda. They are, in downstream order, Vishnuprayag, where the Dhauliganga joins the Alaknanda; Nandprayag, where the Nandakini joins; Karnaprayag, where the Pindar joins, Rudraprayag, where the Mandakini joins; and finally, Devprayag, where the Bhagirathi joins the Alaknanda to form the Ganges River proper. After flowing 250 km (160 mi) through its narrow Himalayan valley, the Ganges emerges from the mountains at Rishikesh, then debouches onto the Gangetic Plain at the pilgrimage town of Haridwar. At Haridwar, a dam diverts some of its waters into the Ganges Canal, which irrigates the Doab region of Uttar Pradesh, whereas the river, whose course has been roughly southwest until this point, now begins to flow southeast through the plains of northern India. The Ganges follows an 800 km (500 mi) arching course passing through the cities of Kannauj, Farukhabad, and Kanpur. Along the way it is joined by the Ramganga, which contributes an average annual flow of about 500 m3/s (18,000 cu ft/s). The Ganges joins the Yamuna at the Triveni Sangam at Allahabad, a holy confluence in Hinduism. At their confluence the Yamuna is larger than the Ganges, contributing about 2,950 m3/s (104,000 cu ft/s), or about 58.5% of the combined flow. Now flowing east, the river meets the Tamsa River (also called Tons), which flows north from the Kaimur Range and contributes an average flow of about 190 m3/s (6,700 cu ft/s). After the Tamsa the Gomti River joins, flowing south from the Himalayas. The Gomti contributes an average annual flow of about 234 m3/s (8,300 cu ft/s). Then the Ghaghara River (Karnali River), also flowing south from the Himalayas of Nepal, joins. The Ghaghara (Karnali), with its average annual flow of about 2,990 m3/s (106,000 cu ft/s), is the largest tributary of the Ganges. After the Ghaghara (Karnali) confluence the Ganges is joined from the south by the Son River, contributing about 1,000 m3/s (35,000 cu ft/s). The Gandaki River, then the Kosi River, join from the north flowing from Nepal, contributing about 1,654 m3/s (58,400 cu ft/s) and 2,166 m3/s (76,500 cu ft/s), respectively. The Kosi is the third largest tributary of the Ganges, after the Ghaghara (Karnali) and Yamuna. Along the way between Allahabad and Malda, West Bengal, the Ganges passes the towns of Chunar, Mirzapur, Varanasi, Ghazipur, Patna, Bhagalpur, Ballia, Buxar, Simaria, Sultanganj, and Saidpur. At Bhagalpur, the river begins to flow south-southeast and at Pakur, it begins its attrition with the branching away of its first distributary, the Bhāgirathi-Hooghly, which goes on to become the Hooghly River. Just before the border with Bangladesh the Farakka Barrage controls the flow of the Ganges, diverting some of the water into a feeder canal linked to the Hooghly for the purpose of keeping it relatively silt-free. The Hooghly River is formed by the confluence of the Bhagirathi River and Jalangi River at Nabadwip, and Hooghly has a number of tributaries of its own. The largest is the Damodar River, which is 541 km (336 mi) long, with a drainage basin of 25,820 km2 (9,970 sq mi). The Hooghly River empties into the Bay of Bengal near Sagar Island. Between Malda and the Bay of Bengal, the Hooghly river passes the towns and cities of Murshidabad, Nabadwip, Kolkata and Howrah. 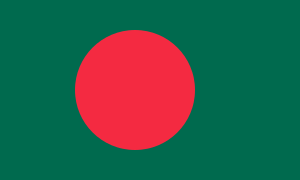 After entering Bangladesh, the main branch of the Ganges is known as the Padma. The Padma is joined by the Jamuna River, the largest distributary of the Brahmaputra. Further downstream, the Padma joins the Meghna River, the second largest distributary of the Brahmaputra, and takes on the Meghna's name as it enters the Meghna Estuary, which empties into the Bay of Bengal. The Ganges Delta, formed mainly by the large, sediment-laden flows of the Ganges and Brahmaputra rivers, is the world's largest delta, at about 59,000 km2 (23,000 sq mi). It stretches 322 km (200 mi) along the Bay of Bengal. Only the Amazon and Congo rivers have a greater average discharge than the combined flow of the Ganges, the Brahmaputra, and the Surma-Meghna river system. In full flood only the Amazon is larger. 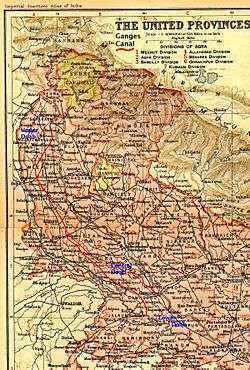 A 1908 map showing the course of the Ganges and its tributaries. 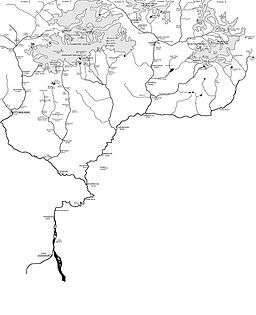 Major left-bank tributaries include Gomti (Gumti), Ghaghara (Gogra), Gandaki (Gandak), and Kosi (Kusi); major right-bank tributaries include Yamuna (Jumna), Son, Punpun and Damodar. The hydrology of the Ganges River is very complicated, especially in the Ganges Delta region. One result is different ways to determine the river's length, its discharge, and the size of its drainage basin. The name Ganges is used for the river between the confluence of the Bhagirathi and Alaknanda rivers, in the Himalayas, and the India-Bangladesh border, near the Farakka Barrage and the first bifurcation of the river. The length of the Ganges is frequently said to be slightly over 2,500 km (1,600 mi) long, about 2,505 km (1,557 mi), to 2,525 km (1,569 mi), or perhaps 2,550 km (1,580 mi). In these cases the river's source is usually assumed to be the source of the Bhagirathi River, Gangotri Glacier at Gomukh, and its mouth being the mouth of the Meghna River on the Bay of Bengal. Sometimes the source of the Ganges is considered to be at Haridwar, where its Himalayan headwater streams debouch onto the Gangetic Plain. This river is the longest in India. During the early Vedic Age of the Rigveda, the Indus and the Sarasvati River were the major sacred rivers, not the Ganges. But the later three Vedas gave much more importance to the Ganges. [lower-alpha 6] The Gangetic Plain became the centre of successive powerful states, from the Maurya Empire to the Mughal Empire. The Ganga is a sacred river to Hindus along every fragment of its length. 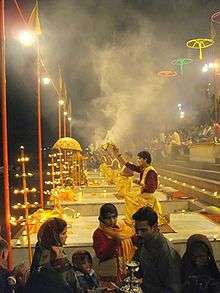 All along its course, Hindus bathe in its waters, paying homage to their ancestors and to their gods by cupping the water in their hands, lifting it and letting it fall back into the river; they offer flowers and rose petals and float shallow clay dishes filled with oil and lit with wicks (diyas). On the journey back home from the Ganga, they carry small quantities of river water with them for use in rituals (ganga jal, literally water of the Ganga). When a loved one dies, Hindus bring the ashes of the deceased person to the Ganga River. The Ganga is the embodiment of all sacred waters in Hindu mythology. Local rivers are said to be like the Ganga, and are sometimes called the local Ganga. The Kaveri river of Karnataka and Tamil Nadu in Southern India is called the Ganga of the South; the Godavari, is the Ganga that was led by the sage Gautama to flow through Central India. The Ganga is invoked whenever water is used in Hindu ritual, and is therefore present in all sacred waters. In spite of this, nothing is more stirring for a Hindu than a dip in the actual river, which is thought to remit sins, especially at one of the famous tirthas such as Gangotri, Haridwar, Prayag, or Varanasi. The symbolic and religious importance of the Ganga is one of the few things that Hindu India, even its sceptics, are agreed upon. Jawaharlal Nehru, a religious iconoclast himself, asked for a handful of his ashes to be thrown into the Ganga. "The Ganga," he wrote in his will, "is the river of India, beloved of her people, round which are intertwined her racial memories, her hopes and fears, her songs of triumph, her victories and her defeats. She has been a symbol of India's age-long culture and civilization, ever-changing, ever-flowing, and yet ever the same Ganga." In late May or early June every year, Hindus celebrate the avatarana or descent of the Ganga from heaven to earth. The day of the celebration, Ganga Dashahara, the dashami (tenth day) of the waxing moon of the Hindu calendar month Jyestha, brings throngs of bathers to the banks of the river. A soak in the Ganga on this day is said to rid the bather of ten sins (dasha = Sanskrit "ten"; hara = to destroy) or alternatively, ten lifetimes of sins. Those who cannot journey to the river, however, can achieve the same results by bathing in any nearby body of water, which, for the true believer, in the Hindu tradition, takes on all the attributes of the Ganga. 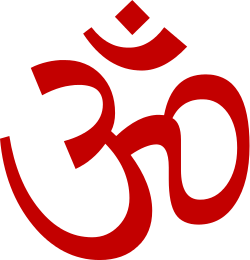 The avatarana is an old theme in Hinduism with a number of different versions of the story. In the Vedic version, Indra, the Lord of Svarga (Heaven) slays the celestial serpent, Vritra, releasing the celestial liquid, the soma, or the nectar of the gods which then plunges to the earth and waters it with sustenance. In the Vaishnava version of the myth, Indra has been replaced by his former helper Vishnu. The heavenly waters are now a river called Vishnupadi (padi: Skt. "from the foot of"). As he completes his celebrated three strides—of earth, sky, and heaven—Vishnu as Vamana stubs his toe on the vault of heaven, punches open a hole, and releases the Vishnupadi, which until now had been circling around the cosmic egg within. Flowing out of the vault, she plummets down to Indra's heaven, where she is received by Dhruva, the once steadfast worshipper of Vishnu, now fixed in the sky as the polestar. Next, she streams across the sky forming the Milky Way and arrives on the moon. She then flows down earthwards to Brahma's realm, a divine lotus atop Mount Meru, whose petals form the earthly continents. There, the divine waters break up, with one stream, the Alaknanda, flowing down one petal into Bharatvarsha (India) as the Ganga. It is Shiva, however, among the major deities of the Hindu pantheon, who appears in the most widely known version of the avatarana story. Told and retold in the Ramayana, the Mahabharata and several Puranas, the story begins with a sage, Kapila, whose intense meditation has been disturbed by the sixty thousand sons of King Sagara. Livid at being disturbed, Kapila sears them with his angry gaze, reduces them to ashes, and dispatches them to the netherworld. Only the waters of the Ganga, then in heaven, can bring the dead sons their salvation. A descendant of these sons, King Bhagiratha, anxious to restore his ancestors, undertakes rigorous penance and is eventually granted the prize of Ganga's descent from heaven. However, since her turbulent force would also shatter the earth, Bhagiratha persuades Shiva in his abode on Mount Kailash to receive Ganga in the coils of his tangled hair and break her fall. Ganga descends, is tamed in Shiva's locks, and arrives in the Himalayas. She is then led by the waiting Bhagiratha down into the plains at Haridwar, across the plains first to the confluence with the Yamuna at Prayag and then to Varanasi, and eventually to Ganga Sagar, where she meets the ocean, sinks to the netherworld, and saves the sons of Sagara. In honour of Bhagirath's pivotal role in the avatarana, the source stream of the Ganga in the Himalayas is named Bhagirathi, (Sanskrit, "of Bhagiratha"). O Mother! …Necklace adorning the worlds! No place along her banks is more longed for at the moment of death by Hindus than Varanasi, the Great Cremation Ground, or Mahashmashana. Those who are lucky enough to die in Varanasi, are cremated on the banks of the Ganga, and are granted instant salvation. If the death has occurred elsewhere, salvation can be achieved by immersing the ashes in the Ganga. 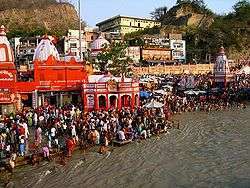 If the ashes have been immersed in another body of water, a relative can still gain salvation for the deceased by journeying to the Ganga, if possible during the lunar "fortnight of the ancestors" in the Hindu calendar month of Ashwin (September or October), and performing the Shraaddha rites. Hindus also perform pinda pradana, a rite for the dead, in which balls of rice and sesame seed are offered to the Ganga while the names of the deceased relatives are recited. Every sesame seed in every ball thus offered, according to one story, assures a thousand years of heavenly salvation for the each relative. Indeed, the Ganga is so important in the rituals after death that the Mahabharata, in one of its popular ślokas, says, "If only (one) bone of a (deceased) person should touch the water of the Ganga, that person shall dwell honoured in heaven." As if to illustrate this truism, the Kashi Khanda (Varanasi Chapter) of the Skanda Purana recounts the remarkable story of Vahika, a profligate and unrepentant sinner, who is killed by a tiger in the forest. His soul arrives before Yama, the Lord of Death, to be judged for the hereafter. Having no compensating virtue, Vahika's soul is at once dispatched to hell. While this is happening, his body on earth, however, is being picked at by vultures, one of whom flies away with a foot bone. Another bird comes after the vulture, and in fighting him off, the vulture accidentally drops the bone into the Ganga below. Blessed by this happenstance, Vahika, on his way to hell, is rescued by a celestial chariot which takes him instead to heaven. Hindus consider the waters of the Ganga to be both pure and purifying. Nothing reclaims order from disorder more than the waters of the Ganga. Moving water, as in a river, is considered purifying in Hindu culture because it is thought to both absorb impurities and take them away. The swiftly moving Ganga, especially in its upper reaches, where a bather has to grasp an anchored chain in order to not be carried away, is considered especially purifying. What the Ganga removes, however, is not necessarily physical dirt, but symbolic dirt; it wipes away the sins of the bather, not just of the present, but of a lifetime. A popular paean to the Ganga is the Ganga Lahiri composed by a seventeenth century poet Jagannatha who, legend has it, was turned out of his Hindu Brahmin caste for carrying on an affair with a Muslim woman. Having attempted futilely to be rehabilitated within the Hindu fold, the poet finally appeals to Ganga, the hope of the hopeless, and the comforter of last resort. Along with his beloved, Jagannatha sits at the top of the flight of steps leading to the water at the famous Panchganga Ghat in Varanasi. As he recites each verse of the poem, the water of the Ganga rises up one step, until in the end it envelops the lovers and carry them away. "I come to you as a child to his mother," begins the Ganga Lahiri. 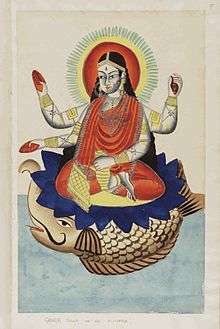 Representation of Goddess Ganga. Kalighat painting. Ganga is a consort to all three major male deities of Hinduism. As Brahma's partner she always travels with him in the form of water in his kamandalu (water-pot). She is also Vishnu's consort. She emanates from his foot as Vishnupadi in the avatarana story, and is also, with Sarasvati and Lakshmi, one of his wives. In one popular story, envious of being outdone by each other, the wives begin to quarrel. While Lakshmi attempts to mediate the quarrel, Ganga and Sarasvati heap misfortune on each other. They curse each other to become rivers, and to carry within them, by washing, the sins of their human worshippers. Soon their husband, Vishnu, arrives and decides to calm the situation by separating the goddesses. He orders Sarasvati to become the wife of Brahma, Ganga to become the wife of Shiva, and Lakshmi, as the blameless conciliator, to remain as his own wife. Ganga and Sarasvati, however, are so distraught at this dispensation, and wail so loudly, that Vishnu is forced to take back his words. Consequently, in their lives as rivers they are still thought to be with him. 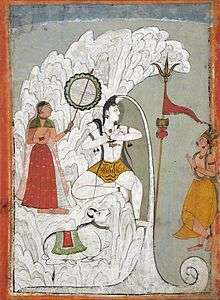 Shiva, as Gangadhara, bearing the Descent of the Ganga, as the goddess Parvati, the sage Bhagiratha, and the bull Nandi look on (circa 1740). It is Shiva's relationship with Ganga, that is the best-known in Ganga theology. Her descent, the avatarana is not a one time event, but a continuously occurring one in which she is forever falling from heaven into his locks and being forever tamed. 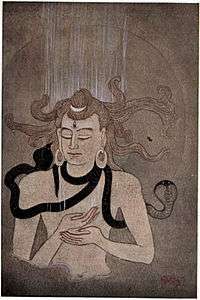 Shiva is depicted in Hindu iconography as Gangadhara, the "Bearer of the Ganga," with Ganga, shown as spout of water, rising from his hair. The Shiva-Ganga relationship is both perpetual and intimate. Shiva is sometimes called Uma-Ganga-Patiswara ("Husband and Lord of Uma (Parvati) and Ganga"), and Ganga often arouses the jealousy of Shiva's better-known consort Parvati. One should not be amazed ... that this Ganga is really Power, for is she not the Supreme Shakti of the Eternal Shiva, taken in the form of water? This Ganga, filled with the sweet wine of compassion, was sent out for the salvation of the world by Shiva, the Lord of the Lords. The Ganga is also the mother, the Ganga Mata (mata="mother") of Hindu worship and culture, accepting all and forgiving all. Unlike other goddesses, she has no destructive or fearsome aspect, destructive though she might be as a river in nature. She is also a mother to other gods. She accepts Shiva's incandescent seed from the fire-god Agni, which is too hot for this world, and cools it in her waters. 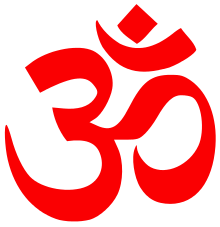 This union produces Skanda, or Kartikeya, the god of war. In the Mahabharata, she is the wife of Shantanu, and the mother of heroic warrior-patriarch, Bhishma. When Bhishma is mortally wounded in battle, Ganga comes out of the water in human form and weeps uncontrollably over his body. The Ganga is the distilled lifeblood of the Hindu tradition, of its divinities, holy books, and enlightenment.As such, her worship does not require the usual rites of invocation (avahana) at the beginning and dismissal (visarjana) at the end, required in the worship of other gods. Her divinity is immediate and everlasting. Early in ancient Indian culture, the river Ganga was associated with fecundity, its redeeming waters and its rich silt providing sustenance to all who lived along its banks. A counterpoise to the dazzling heat of the Indian summer, the Ganga came to be imbued with magical qualities and to be revered in anthropomorphic form. By the 5th century CE, an elaborate theology surrounded the Ganga, now a goddess in her own right, and a symbol for all rivers of India. Hindu temples all over India had statues and reliefs of the goddess carved at their entrances, symbolically washing the sins of arriving worshippers and guarding the gods within. As protector of the sanctum sanctorum, the goddess soon came to depicted with several characteristic accessories: the makara (a crocodile-like undersea monster, often shown with an elephant-like trunk), the kumbha (an overfull vase), various overhead parasol-like coverings, and a gradually increasing retinue of humans. A procession of Akharas marching over a makeshift bridge over the Ganga river. Kumbh Mela at Allahabad, 2001. Kumbh Mela is a mass Hindu pilgrimage in which Hindus gather at the Ganga river. The normal Kumbh Mela is celebrated every 3 years, the Ardh (half) Kumbh is celebrated every six years at Haridwar and Prayag, the Purna (complete) Kumbh takes place every twelve years at four places (Prayag (Allahabad), Haridwar, Ujjain, and Nashik). The Maha (great) Kumbh Mela which comes after 12 'Purna Kumbh Melas', or 144 years, is held at Prayag (Allahabad). 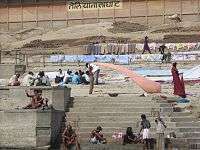 The major event of the festival is ritual bathing at the banks of the river. Other activities include religious discussions, devotional singing, mass feeding of holy men and women and the poor, and religious assemblies where doctrines are debated and standardised. Kumbh Mela is the most sacred of all the pilgrimages. Thousands of holy men and women attend, and the auspiciousness of the festival is in part attributable to this. The sadhus are seen clad in saffron sheets with ashes and powder dabbed on their skin per the requirements of ancient traditions. Some, called naga sanyasis, may not wear any clothes. The Ganga and its tributaries, especially the Yamuna, have been used for irrigation since ancient times. Dams and canals were common in gangetic plain by fourth century BCE. The Ganga-Brahmaputra-Meghna basin has a huge hydroelectric potential, on the order of 200,000 to 250,000 megawatts, nearly half of which could be easily harnessed. As of 1999, India tapped about 12% of the hydroelectric potential of the Ganga and just 1% of the vast potential of the Brahmaputra. Head works of the Ganga canal in Haridwar (1860). photograph by Samuel Bourne. Megasthenes, a Greek ethnographer who visited India during third century BCE when Mauryans ruled India described the existence of canals in the gangetic plain. Kautilya (also known as Chanakya), an advisor to Chandragupta Maurya, the founder of Maurya Empire, included the destruction of dams and levees as a strategy during war. Firuz Shah Tughlaq had many canals built, the longest of which, 240 km (150 mi), was built in 1356 on the Yamuna River. Now known as the Western Yamuna Canal, it has fallen into disrepair and been restored several times. The Mughal emperor Shah Jahan built an irrigation canal on the Yamuna River in the early 17th century. It fell into disuse until 1830, when it was reopened as the Eastern Yamuna Canal, under British control. The reopened canal became a model for the Upper Ganga Canal and all following canal projects. The Ganga Canal highlighted in red stretching between its headworks off the Ganga river in Hardwar and its confluences with the Jumna river in Etawah and with the Ganga in Cawnpore (now Kanpur). The first British canal in India—with no Indian antecedents—was the Ganga Canal built between 1842 and 1854. Contemplated first by Col. John Russell Colvin in 1836, it did not at first elicit much enthusiasm from its eventual architect Sir Proby Thomas Cautley, who balked at idea of cutting a canal through extensive low-lying land in order to reach the drier upland destination. However, after the Agra famine of 1837–38, during which the East India Company's administration spent Rs. 2,300,000 on famine relief, the idea of a canal became more attractive to the Company's budget-conscious Court of Directors. In 1839, the Governor General of India, Lord Auckland, with the Court's assent, granted funds to Cautley for a full survey of the swath of land that underlay and fringed the projected course of the canal. The Court of Directors, moreover, considerably enlarged the scope of the projected canal, which, in consequence of the severity and geographical extent of the famine, they now deemed to be the entire Doab region. A major barrage at Farakka was opened on 21 April 1975, It is located close to the point where the main flow of the river enters Bangladesh, and the tributary Hooghly (also known as Bhagirathi) continues in West Bengal past Kolkata. This barrage, which feeds the Hooghly branch of the river by a 26-mile (42 km) long feeder canal, and its water flow management has been a long-lingering source of dispute with Bangladesh. Indo-Bangladesh Ganga Water Treaty signed in December 1996 addressed some of the water sharing issues between India and Bangladesh. Tehri Dam was constructed on Bhagirathi River, tributary of the Ganga. It is located 1.5 km downstream of Ganesh Prayag, the place where Bhilangana meets Bhagirathi. Bhagirathi is called Ganga after Devprayag. Construction of the dam in an earthquake prone area was controversial. Bansagar Dam was built on the Son River, a tributary of the Ganga, for both irrigation and hydroelectric power generation. 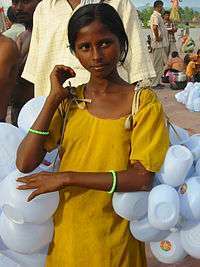 A girl selling plastic containers for carrying Ganga water, Haridwar. The Ganges Basin with its fertile soil is instrumental to the agricultural economies of India and Bangladesh. The Ganges and its tributaries provide a perennial source of irrigation to a large area. Chief crops cultivated in the area include rice, sugarcane, lentils, oil seeds, potatoes, and wheat. Along the banks of the river, the presence of swamps and lakes provide a rich growing area for crops such as legumes, chillies, mustard, sesame, sugarcane, and jute. There are also many fishing opportunities along the river, though it remains highly polluted. Also the major industrial towns of Unnao, Kanpur, situated on the banks of the river with the predominance of tanning industries add to the pollution. Tourism is another related activity. Three towns holy to Hinduism – Haridwar, Prayag (Allahabad), and Varanasi – attract thousands of pilgrims to its waters to take a dip in the Ganges, which is believed to cleanse oneself of sins and help attain salvation. The rapids of the Ganges also are popular for river rafting, attracting adventure seekers in the summer months. Also, several cities such as Kanpur, Kolkata and Patna have developed riverfront walkways along the banks to attract tourists. Human development, mostly agriculture, has replaced nearly all of the original natural vegetation of the Ganga basin. More than 95% of the upper Gangetic Plain has been degraded or converted to agriculture or urban areas. Only one large block of relatively intact habitat remains, running along the Himalayan foothills and including Rajaji National Park, Jim Corbett National Park, and Dudhwa National Park. As recently as the 16th and 17th centuries the upper Gangetic Plain harboured impressive populations of wild Asian elephants (Elephas maximus), tigers (Panthera tigris), Indian rhinoceros (Rhinoceros unicornis), gaurs (Bos gaurus), barasinghas (Rucervus duvaucelii), sloth bears (Melursus ursinus) and Indian lions. In the 21st century there are few large wild animals, mostly deer, boars, wildcats, and small numbers of wolves, jackals, and foxes. Bengal tigers survive only in the Sundarbans area of the Ganga Delta. Crocodiles and barasingha are also found in the Sundarbans. The Sundarbands freshwater swamp ecoregion, however, is nearly extinct. Threatened mammals in the upper Gangetic Plain include the tiger, elephant, sloth bear, and chousingha (Tetracerus quadricornis). Fish are found in all the major rivers of the Ganga basin, and are a vital food source for many people. In the Bengal area common fish include featherbacks (Notopteridae family), barbs (Cyprinidae), walking catfish (Clarias batrachus), gouramis (Anabantidae), and milkfish (Chanos chanos). The critically endangered Ganga shark (Glyphis gangeticus) is also found in the river and other places in Indian subcontinent. Many types of birds are found throughout the basin, such as myna, parrots, crows, kites, partridges, and fowls. Ducks and snipes migrate across the Himalayas during the winter, attracted in large numbers to wetland areas. 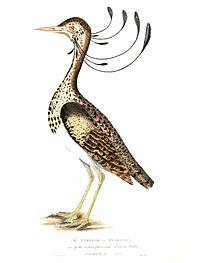 There are no endemic birds in the upper Gangetic Plain. The great Indian bustard (Ardeotis nigriceps) and lesser florican (Sypheotides indicus) are considered globally threatened. 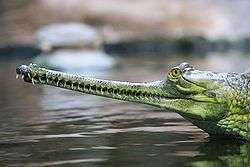 The Ganga River itself supports the mugger crocodile (Crocodylus palustris) and the gharial (Gavialis gangeticus). The river's most famed fauna is the freshwater dolphin Platanista gangetica gangetica, the Ganga river dolphin, recently declared India's national aquatic animal. The Ganga river dolphin, which used to exist in large schools near to urban centres in both the Ganga and Brahmaputra rivers, is now seriously threatened by pollution and dam construction. Their numbers have now dwindled to a quarter of their numbers of fifteen years before, and they have become extinct in the Ganga's main tributaries. [lower-alpha 5] A recent survey by the World Wildlife Fund found only 3,000 left in the water catchment of both river systems. The Ganga river dolphin is one of only five freshwater dolphins in the world. The other four are the baiji (Lipotes vexillifer) of the Yangtze River in China, now likely extinct; the bhulan of the Indus River in Pakistan; the boto of the Amazon River in Brazil; and the Araguaian river dolphin (not considered a separate species until 2014) of the Araguaia–Tocantins basin in Brazil. There are several marine dolphins whose ranges include some freshwater habitats, but these five are the only dolphins who live only in freshwater rivers and lakes. In 2007, the Intergovernmental Panel on Climate Change (IPCC), in its Fourth Report, stated that the Himalayan glaciers which feed the river, were at risk of melting by 2035. The IPCC has now withdrawn that prediction, as the original source admitted that it was speculative and the cited source was not a peer reviewed finding. [lower-alpha 8] In its statement, the IPCC stands by its general findings relating to the Himalayan glaciers being at risk from global warming (with consequent risks to water flow into the Gangetic basin). People bathing and washing clothes in the Ganga. Varanasi, a city of one million people that many pilgrims visit to take a "holy dip" in the Ganga, releases around 200 million litres of untreated human sewage into the river each day, leading to large concentrations of faecal coliform bacteria. According to official standards, water safe for bathing should not contain more than 500 faecal coliforms per 100ml, yet upstream of Varanasi's ghats the river water already contains 120 times as much, 60,000 faecal coliform bacteria per 100 ml. After the cremation of the deceased at Varanasi's ghats the bones and ashes are thrown into the Ganga. However, in the past thousands of uncremated bodies were thrown into the Ganga during cholera epidemics, spreading the disease. 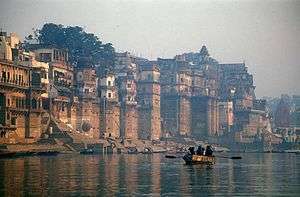 Even today, holy men, pregnant women, people with leprosy/chicken pox, people who had been bitten by snakes, people who had committed suicide, the poor, and children under 5 are not cremated at the ghats but are floated free to decompose in the waters. In addition, those who cannot afford the large amount of wood needed to incinerate the entire body, leave behind a lot of half burned body parts. In November 2008, the Ganga, alone among India's rivers, was declared a "National River", facilitating the formation of a National Ganga River Basin Authority that would have greater powers to plan, implement and monitor measures aimed at protecting the river. In July 2014, the Government of India announced an integrated Ganga-development project titled Namami Ganga and allocated ₹2,037 crore for this purpose. The incidence of water-borne and enteric diseases – such as gastrointestinal disease, cholera, dysentery, hepatitis A and typhoid – among people who use the river's waters for bathing, washing dishes and brushing teeth is high, at an estimated 66% per year. Recent studies by Indian Council of Medical Research (ICMR) say that the river is so full of killer pollutants that those living along its banks in Uttar Pradesh, Bihar and Bengal are more prone to cancer than anywhere else in the country. Conducted by the National Cancer Registry Programme under the ICMR, the study throws up shocking findings indicating that the river is thick with heavy metals and lethal chemicals that cause cancer. According to Deputy Director General of NCRP A. Nandkumar, the incidence of cancer was highest in the country in areas drained by the Ganga and stated that the problem would be studied deeply and with the findings presented in a report to the health ministry. Along with ever-increasing pollution, water shortages are getting noticeably worse. Some sections of the river are already completely dry. Around Varanasi the river once had an average depth of 60 metres (200 ft), but in some places it is now only 10 metres (33 ft). Illegal mining in the Ganga river bed for stones and sand for construction work has been a long problem in Haridwar district, Uttarakhand, where it touches the plains for the first time. This is despite the fact that quarrying has been banned in Kumbh Mela area zone covering 140 km2 area in Haridwar. On 14 June 2011, Swami Nigamanada, a 34-year-old monk who was fasting since 19 February that year against illegal mining and stone crushing along the Ganga near Haridwar, died at the Himalayan Hospital in Jollygrant in Dehradun, after prolonged coma in the hospital's intensive care unit. His death put a spotlight on the activity and resulted in the intervention of the Union Environment minister. "The Ganga Action Plan, commonly known as GAP, was launched dramatically in the holy city of Banares (Varanasi) on 14 June 1985, by Prime Minister Rajiv Gandhi, who promised, 'We shall see that the waters of the Ganga become clean once again.' The stated task was 'to improve water quality, permit safe bathing all along the 2,525 kilometers from the Ganga's origin in the Himalayas to the Bay of Bengal, and make the water potable at important pilgrim and urban centres on its banks.' The project was designed to tackle pollution from twenty-five cities and towns along its banks in Uttar Pradesh, Bihar, and West Bengal by intercepting, diverting, and treating their effluents. With the GAP's Phase II, three important tributaries—Damodar, Gomati, and Yamuna—were added to the plan. Although some improvements have been made to the quality of the Ganges's water, many people claim that the GAP has been a major failure. The environmental lawyer M. C. Mehta, for example, filed public interest litigation against project, claiming 'GAP has collapsed.'" ↑ Salman & Uprety (2002, pp. 172, 178–187, 387–391)Treaty Between the Government of the Republic of India and the Government of the People's Republic of Bangladesh on Sharing of the Ganga/Ganges Waters at Farakka. ↑ The IPCC report is based on a non-peer reviewed work by the World Wildlife Federation. They, in turn, drew their information from an interview conducted by New Scientist with Dr. Hasnain, an Indian glaciologist, who admitted that the view was speculative. See: "Sifting climate facts from speculation". 13 January 2010. and "Pachauri calls Indian govt. report on melting Himalayan glaciers as 'voodoo science'". Thaindian News. 9 January 2010. On the IPCC statement withdrawing the finding, see: "IPCC statement on the melting of Himalayan glaciers" (PDF). IPCC - Intergovernmental Panel on Climate Change. 20 January 2010. 1 2 Kumar, Singh & Sharma 2005. ↑ "US TV host takes dig at Ganges". Zeenews.com. 16 December 2009. Retrieved 4 July 2012. ↑ Bhattacharji, Sukumari; Bandyopadhyay, Ramananda (1995). Legends of Devi. Orient Blackswan. p. 54. ISBN 978-81-250-0781-4. Retrieved 27 April 2011. 1 2 3 4 5 6 7 "Ganges River". Encyclopædia Britannica (Encyclopædia Britannica Online Library ed.). 2011. Retrieved 23 April 2011. ↑ Penn, James R. (2001). Rivers of the world: a social, geographical, and environmental sourcebook. ABC-CLIO. p. 88. ISBN 978-1-57607-042-0. Retrieved 23 April 2011. 1 2 Krishna Murti 1991, p. 19. 1 2 3 Jain, Agarwal & Singh 2007, p. 341. 1 2 3 Gupta 2007, p. 347. ↑ Dhungel & Pun 2009, p. 215. 1 2 3 Chakrabarti 2001, pp. 126–127. 1 2 3 4 Parua 2009. 1 2 3 4 Arnold 2000. 1 2 Elhance 1999, pp. 156–158. 1 2 3 Ali & Aitchison 2005. ↑ Prakash, B.; Sudhir Kumar; M. Someshwar Rao; S. C. Giri (2000). "Holocene tectonic movements and stress field in the western Gangetic plains" (PDF). Current Science. 79 (4): 438–449. ↑ Dmowska, Renata (2003). Advances in Geophysics. Academic Press. p. 14. ISBN 978-0-12-018846-8. Retrieved 6 May 2011. 1 2 Merriam-Webster (1997). Merriam-Webster's geographical dictionary. Merriam-Webster. p. 412. ISBN 978-0-87779-546-9. Retrieved 23 April 2011. 1 2 3 Jain et al. pp334–342. 1 2 Berga 2006, p. 1304. ↑ Dhungel & Pun 2009, p. 210. ↑ Dhungel & Pun 2009. ↑ Roger Revelle; V. Lakshminarayan (9 May 1975). "The Ganges Water Machine". Science. 188 (4188): 611–616. doi:10.1126/science.188.4188.611. ↑ Suvedī 2005, p. 61. ↑ Eric Servat; IAHS International Commission on Water Resources Systems (2002). FRIEND 2002: Regional Hydrology: Bridging the gap between research and practice. IAHS. p. 308. ISBN 978-1-901502-81-7. Retrieved 18 April 2011. ↑ "Mount Everest, China/Nepal". Retrieved 12 March 2014. ↑ "Kāngchenjunga, India/Nepal". Retrieved 12 March 2014. ↑ "Lhotse, China/Nepal". Retrieved 12 March 2014. ↑ "Makalu, China/Nepal". Retrieved 12 March 2014. ↑ "Cho Oyu, China/Nepal". Retrieved 12 March 2014. ↑ "Dhaulāgiri, Nepal". Retrieved 12 March 2014. ↑ "Manaslu, Nepal". Retrieved 12 March 2014. ↑ "Annapūrna, Nepal". Retrieved 12 March 2014. ↑ "Shishapangma, China". Retrieved 12 March 2014. ↑ Krishna Murti 1991, p. 10. 1 2 Salman & Uprety 2002, p. 133. ↑ Catling, David (1992). Rice in deep water. International Rice Research Institute. p. 175. ISBN 978-971-22-0005-2. Retrieved 23 April 2011. ↑ "Brahmaputra River". Encyclopædia Britannica (Encyclopædia Britannica Online Library ed.). 2011. Retrieved 25 April 2011. ↑ McIntosh, Jane (2008). The ancient Indus Valley: new perspectives. ABC-CLIO. pp. 99–101. ISBN 978-1-57607-907-2. Retrieved 25 April 2011. ↑ "Largest, Longest, Highest and Smallest In India". onlineGKguide.com. Retrieved 7 September 2008. ↑ Salman & Uprety 2002, pp. 136–137. 1 2 Eck 1982, p. 212. 1 2 Eck 1982, pp. 212-213. 1 2 3 4 5 Eck 1982, p. 214. 1 2 3 Eck 1982, pp. 214-215. 1 2 3 4 5 6 7 8 Eck 1998, p. 144. 1 2 3 4 5 Eck 1998, pp. 144–145. 1 2 3 Eck 1998, p. 145. 1 2 3 4 5 6 Eck 1998, pp. 145–146. 1 2 3 Eck 1982, p. 215. 1 2 Eck 1982, pp. 215–216. ↑ Eck 1982, p. 216. ↑ Eck 1982, pp. 216–217. 1 2 3 4 5 Eck 1982, pp. 217. 1 2 Eck 1982, p. 218. 1 2 3 4 5 6 7 8 9 10 11 Eck 1982, p. 219. ↑ Eck 1998, p. 146. 1 2 3 4 5 Eck 1998, p. 147. ↑ Eck 1998, p. 218. 1 2 3 4 5 Eck 1998, p. 149. ↑ Blurton 1993, p. 100. 1 2 Wangu 2003, p. 90. 1 2 3 4 Pal 1997, p. 43. 1 2 Rodda & Ubertini 2004. ↑ "Life". A Million Hindus Wash Away Their Sins. 18: 25–29. 1 May 1950. ↑ Maharaj (25 October 2012). "Kumbh Mela, most sacred of Hindu pilgrimages". Guardian. Retrieved 10 May 2013. ↑ Mani, Rajiv (9 February 2013). "The 17 'shringars' of Naga sadhus". Times of India. Allahabad. Retrieved 10 May 2013. 1 2 Singh 2005, pp. 69–79. ↑ Elhance 1999, p. 163. ↑ "Uttar Pradesh General Knowledge"
↑ Prakash 1999, p. 162. 1 2 Brichieri-Colombi & Bradnock 2003. ↑ M. Rafiqul Islam (1987). "The Ganges Water Dispute: An Appraisal of a Third Party Settlement". Asian Survey. 27 (8): 918–934. doi:10.1525/as.1987.27.8.01p0082a. ↑ Sharma, Bahuguna & Chauan 2008. ↑ Fred Pearce; Rob Butler (26 January 1991). "The dam that should not be built". NewScientist. ↑ "Bansagar Dam project" (PDF). Government of India Ministry of Water Sources. Archived from the original (PDF) on 8 October 2011. Retrieved 27 April 2011. ↑ "Report of the committee on pollution caused by leather tanning industry to the water bodies / ground water in Unnao district of Uttar Pradesh" (PDF) (PDF). Retrieved 23 April 2014. ↑ Sushovan Sircar (11 March 2014). "Take a walk along the Hooghly". The Telegraph. Retrieved 24 April 2014. ↑ Piyush Kumar Tripathi (3 August 2013). "Funds flow for riverfront project". The Telegraph. Retrieved 24 April 2014. ↑ "Ganga pathway to be complete in three years". The Times of India. 22 April 2014. Retrieved 24 April 2014. 1 2 3 4 5 6 "Upper Gangetic Plains moist deciduous forests". Terrestrial Ecoregions. World Wildlife Fund. Retrieved 6 May 2011. ↑ "Sundarbans freshwater swamp forests". Terrestrial Ecoregions. World Wildlife Fund. Retrieved 6 May 2011. ↑ "Glyphis gangeticus, Ganges shark". FishBase. Retrieved 7 May 2011. ↑ "Ganges River Dolphin Declared India's National Aquatic Animal". WildPolitics.net. Retrieved 6 May 2011. 1 2 3 4 "Lower Gangetic Plains moist deciduous forests". Terrestrial Ecoregions. World Wildlife Fund. Retrieved 6 May 2011. ↑ "WWF – Ganges River dolphin". Wwf.panda.org. Retrieved 4 July 2012. ↑ (AFP) – 17 August 2009 (17 August 2009). "Global warming benefits to Tibet: Chinese official. Reported 18/Aug/2009". Google.com. Archived from the original on 23 January 2010. Retrieved 28 November 2010. ↑ "See s. 10.6 of the WGII part of the report at" (PDF). Retrieved 28 November 2010. ↑ "June 2003 Newsletter". Clean Ganga. Retrieved 16 July 2010. ↑ Salemme, Elisabeth (22 January 2007). "The World's Dirty Rivers". Time. Retrieved 3 May 2010. 1 2 3 4 5 6 Abraham 2011. ↑ Akanksha Jain (23 April 2014). "'Draw plan to check Ganga pollution by sugar mills'". The Hindu. Retrieved 24 April 2014. 1 2 "India and pollution: Up to their necks in it", The Economist, 27 July 2008. 1 2 "Ganga can bear no more abuse". Times of India. 18 July 2009. ↑ HINDU FUNERALS, CREMATION AND VARANASI Archived 16 October 2013 at the Wayback Machine. ↑ "World Bank loans India $1bn for Ganges river clean up". BBC News. 3 December 2009. Retrieved 28 November 2010. ↑ "Namami Ganga development Project gets 2037 crores". IANS. news.biharprabha.com. Retrieved 10 July 2014. 1 2 "Looting the Ganga shamelessly". The Tribune. 16 June 2011. ↑ Swami Nigamananda, fasting to save Ganga, dies NDTV 14 June 2011. ↑ "Exposing the illegal mining in Haridwar". NDTV. 16 June 2011. ↑ "Jairam Ramesh tells Uttarakhand CM Nishank to stop illegal mining in Ganga". Economic Times. 18 June 2011. Abraham, Wolf-Rainer. "Megacities as Sources for Pathogenic Bacteria in Rivers and Their Fate Downstream" (PDF). International Journal of Microbiology. 2011 (798292): 1–13. doi:10.1155/2011/798292. Ali, Jason R.; Aitchison, Jonathan C. (2005). "Greater India". Earth-Science Reviews. 72 (3–4): 169–188. doi:10.1016/j.earscirev.2005.07.005. Arnold, Guy (2000). World Strategic Highways (1st ed.). Fitzroy Dearborn. pp. 223–227. doi:10.4324/9781315062204. ISBN 978-1579580988. Brune, James N. (1993). "The seismic hazard at Tehri dam". Tectonophysics. Elsevier. 218 (1–3): 281–286. doi:10.1016/0040-1951(93)90274-N.
Dudgeon, David (2005). "River Rehabilitation for Conservation of Fish Biodiversity in Monsoonal Asia" (PDF). Ecology and Society. 10 (2:15). Hill, Christopher V. "3 The Mauryan Empire and the Classical Age – Irrigation in Early India". South Asia: an environmental history. p. 32. ISBN 978-1851099252. Krishna Murti, C. R. (1991). The Ganga, a scientific study. Gaṅgā Pariyojanā Nideśālaya; India Environment Research Committee. Northern Book Centre. ISBN 978-8172110215. Kumar, Rakesh; Singh, R. D.; Sharma, K. D. (10 September 2005). "Water Resources of India" (PDF). Current Science. Bangalore: Current Science Association. 89 (5): 794–811. Archived (PDF) from the original on 14 October 2013. Retrieved 13 October 2013. Mirza, M. Monirul Qader (2004). The Ganges water diversion: environmental effects and implications. Dordecht: Springer. pp. 1–6. doi:10.1007/978-1-4020-2792-5. ISBN 978-9048166657. Rodda, John C.; Ubertini, Lucio (2004). "The Basis of Civilization: Water Science?". IAHS publication no. 286. Wallingford, Oxfordshire, UK: International Association of Hydrological Sciences, IAHS International Commission on Water Resources Systems: 165. ISBN 978-1901502572. Sharma, Ramesh C.; Bahuguna, Manju; Chauhan, Punam (2008). "Periphytonic diversity in Bhagirathi:Preimpoundment study of Tehri dam reservoir". Journal of Environmental Science and Engineering. 50 (4): 255–262. PMID 19697759. Thapar, Romila (October 1971). "The Image of the Barbarian in Early India". Comparative Studies in Society and History. CUP. 13 (4): 408–436. doi:10.1017/s0010417500006393. JSTOR 178208. Wink, André (2002). "From the Mediterranean to the Indian Ocean: Medieval History in Geographic Perspective". Comparative Studies in Society and History. 44 (3): 416–445. doi:10.1017/s001041750200021x. JSTOR 3879375. Bahar Dutt, "Saving the Ganges" on YouTube CNN-IBN Live 5 May 2012.